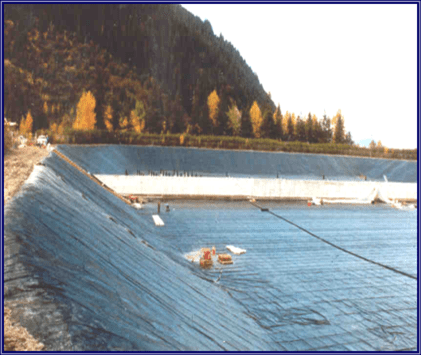 The Lowell Point wastewater treatment plant receives and treats all wastewater generated by the residents and businesses in the city of Seward, Alaska. Seward is located south of Anchorage on the Kenai Peninsula overlooking the pristine Resurrection Bay, a whale and porpoise habitat. The Lowell Point plant utilizes an extended aeration treatment process followed by polishing and some amount of seasonal detention. The entire process is contained in one 250,000-square-foot lined impoundment, with an internal fixed separation wall. 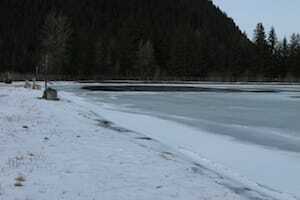 The impoundment is located adjacent to Resurrection Bay and is 40 feet deep, putting the bottom at sea level. Soils in Alaska contain high amounts of gravel, yielding high permeability. Any leaks in the impoundment, therefore, travel rapidly. 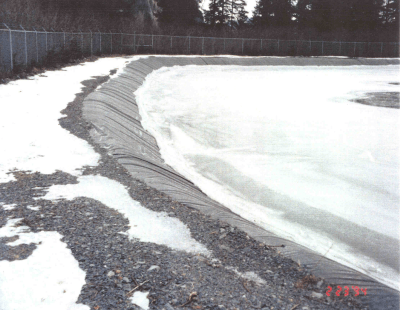 When the impoundment was constructed in 1991, the city and its consulting engineers wanted a reliable geomembrane barrier and one with longevity. They didn’t want the expense and maintenance of overburden to protect the liner from mechanical damage and thermal expansion-contraction. Additionally, there were concerns about ice buildup and the strength to resist. They chose a reinforced ethylene copolymer membrane which met all of the project and owner requirements. The treatment facility has been in continuous operation since original construction. There has been minor maintenance and upgrades, but no changes or alterations to the lining system. Shallow groundwater wells adjacent to the impoundment are monitored for the presence of wastewater, thus ensuring the integrity of the containment system. An inspection of the liner in 2018 revealed no issues and signs of degradation or mechanical damage. After 27 years of service, it’s still protecting the cold, clear water of Resurrection Bay.